Two yachts collided on the Hudson River in New Jersey Thursday evening, one of them hosting a high school senior prom, authorities say. 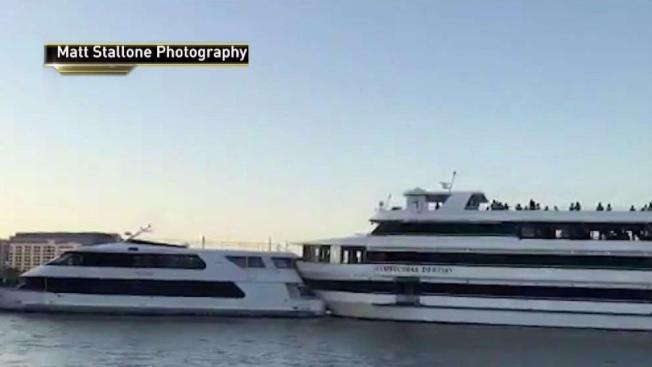 Weehawken High School officials say a yacht hosting its senior prom crashed into an empty boat docked at Pier 14 in Hoboken around 7:30 p.m.
Video posted to social media shows the yacht, Cornucopia Destiny, rear-ending the smaller docked yacht, which then crashes into the pier. Photos from the scene show broken-out windows on the boat, and bent railings on the pier. Onlookers could be heard in the video gasping and reacting in shock as they watched the crash. Seventy-five students had just boarded the Cornucopia Destiny for the Weehawken High School senior prom, police said. They were not injured, but their prom was cut short and they had to board school buses shortly afterward to head to the Weehawken Elks, where they were allowed to stay until the midnight. The prom has been rescheduled for June 10 aboard the Spirit of New Jersey, according to the schools superintendent. There was minor damage to the boat and pier. Police are investigating the cause of the collision.